ClickVerse.com is a web based application providing computer simulated study partners for business and education. Its computer simulated study partners are 10-12 fact based questions asked randomly and repeatedly for 60 seconds. The object of each study partner is to answer each question correctly as many times as possible within the one minute interval. Statistics and analytics are measured for each millisecond of usage — providing instant feedback and advice for effective and efficient online education. All computer simulated study partners offered on ClickVerse.com follow a similar and concise structure. However, slight differences in the learning formats from testing tools to studying tools and digital reporting make ClickVerse.com a versatile online educational platform easily customizable to the unique learning habits of individuals. The following information covers a brief visual overview of 3 testing tools, 6 study tools, 9 analytical reports, multiple create features, and 2 award features. These components provide a breadth of opportunity for members to increase their knowledge base at their own pace. Each ClickVerse.com membership includes unlimited access to create and use computer simulated study partners in order to achieve higher intelligence in the areas most relevant to ones career and education. Take It presents each study partner within a 60-second time constraint and asks questions one-by-one in a multiple choice format. Type-in is exactly the same as Take It except that instead of displaying the answers as multiple choice, the user must type-in the correct answer. Before gaining access to the Digital Worksheet feature a user must demonstrate proficiency in that study partner. Thus, the digital worksheet feature is unlocked by receiving a score of 100% or higher 3 times consecutively on a Take It. Unlike Take It and Type-in, the digital worksheet has no time constraint and does not present questions one at a time. Rather, all 10-12 questions from the study partner are asked at once and all answers must be typed in directly next to each question. Members receive a score on accuracy and are notified how long it took to complete the digital worksheet. Scoring 75% or higher is of critical importance for access and activation of one of the award features, WorkCerts, discussed in the later sections. Preview offers a convenient method for familiarizing oneself with new content. In this mode of study questions are asked as though in Take It mode except that correct answers are highlighted with a white background. There are 3 preview speed modes for reviewing each question/answer combination at a faster or slower speed. The slow setting resets the timer to 130 seconds and displays all the study partner questions and answers at least once before time runs out. Standard speed resets the timer to 60 seconds and displays all the study partner questions and answers at least once before the time runs out. Fast speed resets the timer to 60 seconds and attempts to display all study partner questions and answers more than once before time runs out. Similar to preview, Study places emphasis on the correct answer by making it the top answer option for each question. Customizable settings include: number of answers to show, random or sequential order, and all or R3 (random 3) questions displayed at a time. Cram It offers a more intensive training simulation. It is 5 rounds of 60 seconds each (5 minutes total) with 10 second intervals in between each round. The first 4 rounds break the 10-12 question study partner into 2-3 questions per round. Each of the first 4 rounds ask 2-3 questions repeatedly for 60-seconds while the corresponding correct answers are provided as reference. The final round is a Take It session of the full study partner with no answers visible for reference. The final report provides the Review, a round-by-round breakdown of each of question/correct answer combination along with performance times and accuracy. Two additional study tools for each individual study partner become available once the digital worksheet is unlocked by receiving a score of 100% or higher 3 times consecutively on Take It. Printable Flashcards are the questions and corresponding correct answers displayed in printable flashcard format for easy offline study and review. Another unlocked study feature includes the Printable Worksheet, an offline version of the digital worksheet with the option of displaying or not displaying the correct answers upside-down at the bottom of the worksheet printout. A number of performance-based statistics are calculated per overall study partners taken as well as per each individual study partner. The first statistic is called Knowledge and represents knowledge-based percentage of study partners taken. This means on an individual study partner basis, Knowledge can be either 0% or 100%. It reflects whether a user knows all the content in the study partner. If a single answer is incorrect the knowledge base percentage goes to 0%. As soon as all questions are answered correctly again it will return to 100%. The overall knowledge base percentage is calculated based on the number of study partners with individual knowledge base percentage of 100% out of the total number of study partners taken. Retention measures how much of the study partner content is retained from one take to the next and ranges from 0%-100%. How many times a user is able to answer questions correctly within the 60 second study partner timeframe is called Fluency. It represents how quickly the mind accurately processes information. The Focus statistic averages the number of questions a user is able to answer within the 60 second interval for each individual study partner. It ranges from 0%-100%, where any percentage greater than 50 reflects above average focus. The average of all scores received is the Proficiency statistic. It reflects how experienced a user is with the content in the study partners taken. Another performance-based statistic is the Learning Curve. This statistic is measured for each study partner taken as well as for each category and subcategory of study partners. Learning curves are measured as units of time where any time less than 2 minutes is displayed in seconds. An above average learning curve is 30 seconds or less. 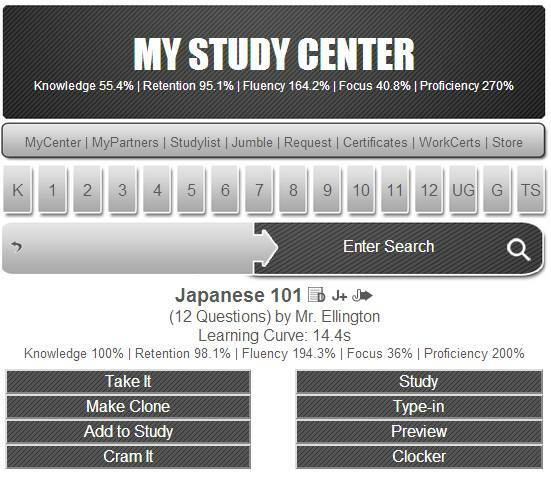 The learning curve utilizes statistics from focus and retention to content-based performance in order to measure how fast a user is able to learn new content in a category, subcategory, or individual study partner respectively. Several self-evaluation features are available through the overall reporting tools of Click by Clicks and Progress Reports. The main difference between the two is that click-by-clicks report performance based by time whereas progress reports report performance based by study partner. 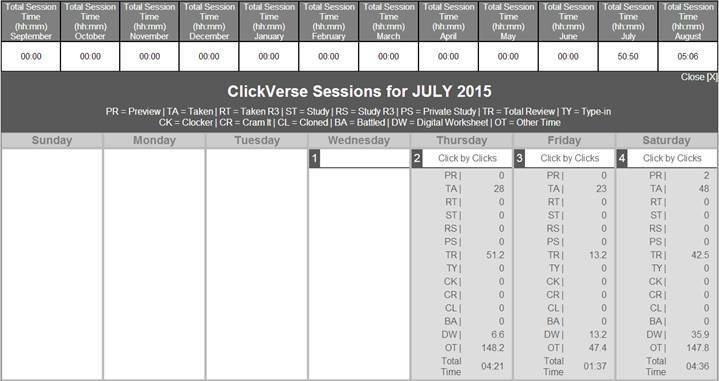 Click by clicks report daily logs displaying the time, duration, and grade of each activity performed by the user. Progress reports provide more detailed statistics of each single study partner including overall stats of: time taken, score, number of answers correct, number of answers incorrect, and grade. More specific statistics are available by clicking on the grade statistic listed in the last column. This opens a full report breakdown for that individual instance of the study partner being taken. It offers a comparison between that individual score versus the first time taken. Records of percentage accuracy, number of times asked, number of times answered correct, slowest answer time, fastest answer time, and average answer time per question are reported in the Detailed Stats section. Also, each question with corresponding correct answer is displayed in the Detailed Stats section offering an informative review of ones performance. Overall high scores for the study partner, the user’s individual score, recommendations for other study partners to take, and options for taking the study partner again all are featured in the progress reports. While progress reports and click by clicks offer very detailed statistics, Monthly Reports give a more consolidated account of user activity. They simply state the amount of time in minutes and hours that a user has spent on ClickVerse.com for each respective month. By clicking on the monthly session time, a calendar of the month is displayed offering a breakdown of how time was spent each day: Time spent in Preview mode is listed by PR; TA is for Take It; Take It time spent using the R3 (random 3) feature is represented by RT; ST is for Study; Study time spent using the R3 (random 3) feature is represented by RS; Private Study time is represented by PS; The time spent reviewing analysis and progress reports after taking study partners is the total review time and is represented by TR; TY is for the time spent taking the Type-in; CK is for the clocker (speed training); Cram It time is abbreviated by CR; Time spent creating a clone (a personal playback copy of a user’s exact take it performance) is represented by CL; BA represents the time spent in battle mode (taking a study partner vs. a clone); DW is for Digital Worksheet time; and all other time spent is indicated by OT. Although ClickVerse memberships include unlimited access to a library of preloaded study partners, it is not all-encompassing. Users may want to add their own content. For that reason, ClickVerse provides Multiple Create Features. 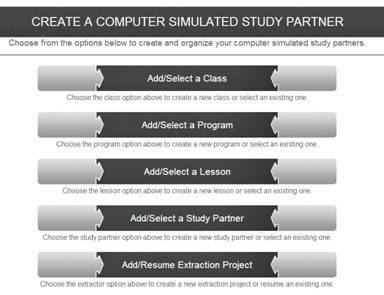 A custom study partner can be created as a standalone or as part of a lesson, program, or class. Classes, programs, and lessons offer structured formats for grouping and ordering study partners based on educational or professional projects and needs. Manual creation of study partners requires question by question input as well as incorrect answers submitted by the user. An alternative method to manually creating study partners is offered by the Extractor. Users can copy and paste text as well as upload images in bulk. The extractor takes the loaded content and breaks it into more manageable segments. Users then merely have to highlight, select, and/or edit the loaded material until they have the study partner questions relevant to their project. One of the main goals of ClickVerse.com is to help users achieve higher intelligence through the use of computer simulated study partners. Certifications and Work Certs were created in order to share that achievement for academic and employment purposes. Certificates are earned for an individual study partner when the user scores 100% or higher 3 times consecutively using Take It. WorkCerts are earned when the user scores 75% or higher on the corresponding digital worksheet for that study partner. Users can pick and choose which certifications and Work Certs to authorize for access by potential employers. The certificate and work cert show knowledge base, retention, fluency, focus, and proficiency for the 3 consecutively scored study partners. The date earned, name of recipient, and digital worksheet statistics are also provided so that employers can better match potential candidates with available positions. All of the features and services offered by ClickVerse.com are available beyond a single membership. For instance, family plans, book, group, and data enrollments offer shared access to study partners, progress reports, click by clicks, certificates, work certs, and more. For more information, go to http://www.ClickVerse.com. © 2010-2015 CLICKVERSE LLC All rights reserved.